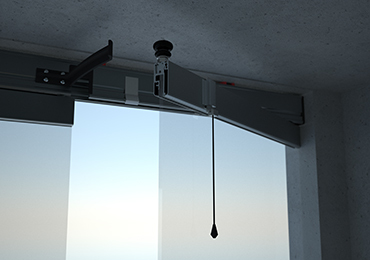 Our glass curtains system is durable, easy and pleasant to use when you follow the operating instructions. Children and guests should also be instructed on how to use the system. The glass elements should open with ease when handled appropriately. 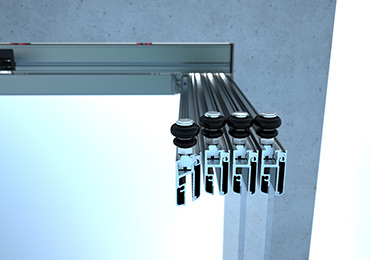 If you experience resistance when opening a glass element at the opening gap, avoid using force. Instead, hold the element and push it lightly backwards while sliding it all the way to the side. Then try opening it again. When you slide the glass elements past the opening gaps, the glass might jump slightly. This can be avoided by pushing the glass lightly outwards when passing opening gaps. 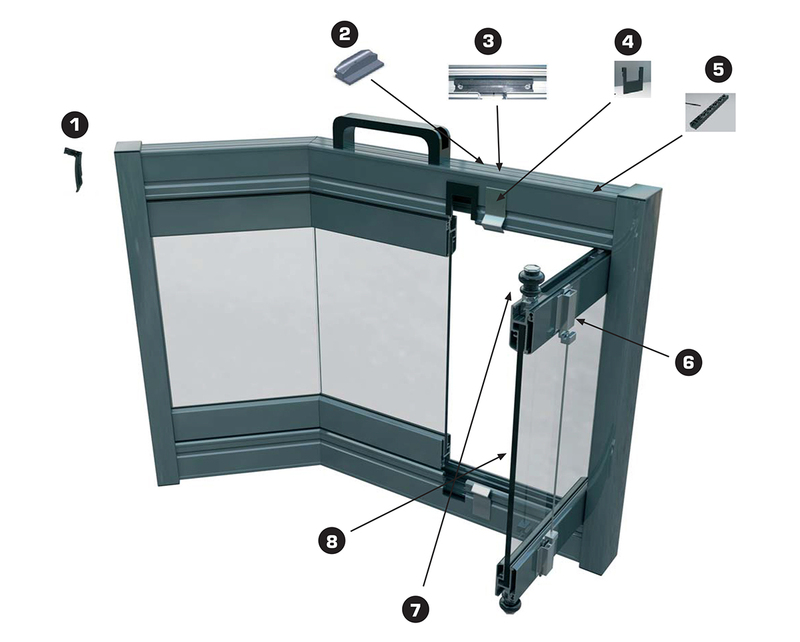 Do not attached anything to the aluminium profiles or other parts of the system. Also, do not detach system components. Please note that detaching the wheel guide may cause the hinge piece to break, as the purpose of the wheel guide is to guide the glass to the right opening position. If the glass element is opening in the wrong position the hinge will break. The seal in the lower profile may freeze in the winter, which makes it harder to move the glass. The glass will slide better when pushed lightly outwards from the middle. Sometimes, the system requires two opening gaps. That being the case, particular attention should be paid when opening glass elements. The elements should always be slid all the way to the side before opening. If a glass is opened at the wrong opening gap, it will not reach the hinge piece and get locked into the right position. This may lead to the glass falling off the rail. To fix this, lift the glass panel back onto the rail and slide it all the way to the side before opening. The lower steering profile should be cleaned of dust, leaves and other rubbish from time to time. All the components are waterproof, so the lower profile can also be washed if necessary. If the system has PVC seals, regular ventilation is recommended. 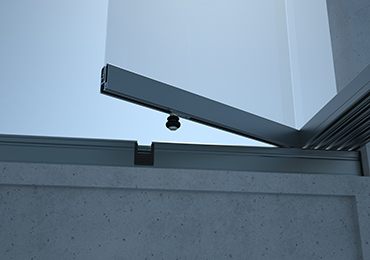 If the glass elements do not have silicone seals, it is possible for small amounts of dust and snow to enter the balcony. In this case, the system will not be completely watertight either. In cold weather, it is normal for water to get condensed on the glass. Open the ventilation window by twisting the knob while pulling the rope downwards. Pull the opening window towards yourself and open it fully to a 90-degree angle. Inox locks are opened by twisting the knob (inox lock with a knob) or by pulling the connecting cable towards you (double inox lock with a cable). Slide the next glass element as close to the open ventilation window as possible and repeat to open as many elements as you wish. Always remember to lock the glass elements together when they are opening using either a wall loop or a locking device. This is to prevent potential collisions and damage to the glass elements caused by, for instance, the wind. Perform the before mentioned actions in reverse order to close the glass elements. Remember to twist the knob to lock the system. A gap of 2mm has to be left between the first and second glass to allow sufficient space for opening them later on. The glazed space can be aired through a half open ventilation window. Pull the rope/knob/cable and only open the ventilation window half way. Let the ventilation device/lock fall into a rail in the wheel guide. The ventilation window will now be steady even though it is not fully open. The cleaning requirements for the system are subject to its location and prevailing conditions. Alcohol-free domestic cleaner can be used for the purpose. Do not use strong solvents, acids or lye. Excessive rubbing should be avoided. Under normal conditions, the system does not require regular maintenance. It is recommended to spray any moving parts with a silicone spray a few times a year.